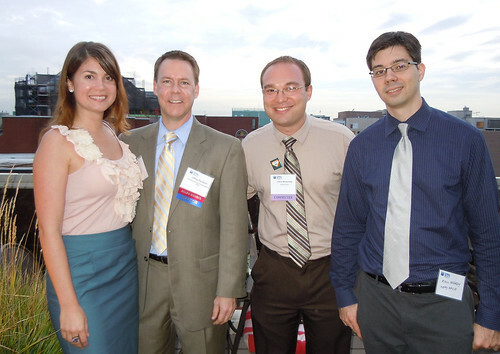 Last Wednesday, a large crowd gathered at the Beacon Hotel Sky Bar to mark the kick-off of our 2010-11 SMPS program year and to celebrate the news that the DC Chapter recently surpassed San Francisco Chapter asthe nation’s largest, with 274 professionals. Despite the evening’s rainy weather, a record 29 people arrived an hour earlier to attend this fall’s New Member Orientation, learning how to get the most out of their investment in SMPS from a number of fantastic speakers. Before the night was through, new member Shira Pinsker from RTKL won her very own iPad! Our chapter president, Alison Carney, CPSM, was on hand to welcome everyone and discuss a number of different ways to get involved. She described each of our seven committees and introduced a new volunteer group forming this year, whose purpose is to provide event organizers with names of people who are willing to help occasionally on an as-needed basis, but who are not able to commit to joining a committee full time. Other initiatives geared towards new members include the Envoy program, which, for those who request it, provides someone to help make introductions at networking events, and the Guru Guidance mentoring program. Tina Myers, CAE, Vice President of Membership and Chapter Development with SMPS National provided an overview of some of the opportunities for members that National offers, including educational webinars, the annual Build Business conference, and the mysmps online community. As a special perk to those joining before December 2010, she also explained the New Member Challenge. By taking the following steps within 12 months of joining SMPS, new members are much more likely to experience the breadth of resources at their disposal. In exchange for this level of engagement, National will send a $50 gift card to everyone who completes their scorecard. Finally, Kevin Doyle, SMPS National’s Certification and IT Manager, energized the room with his description of the benefits of CPSM certification, and of the resources that the chapter offers to help its members achieve this prestigious designation. There is an exciting year of programming ahead for SMPS DC. We are lucky to be a part of one of the nation’s most vibrant chapters – and one of only two that have grown in the past year, despite the weak economy. Remember too that if you recruit a new SMPS member, the organization will extend your own membership by three months. We already had incredible turnout last week - with your help, we can attract even more new and prospective members to our spring orientation session! By: Jason Moskowitz Wilmot Sanz, Inc.